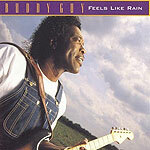 CD review: "Feels Like Rain"
This may be the best album Buddy Guy has yet recorded; certainly, it's among his very best. Considering how few albums he's recorded in his 30-year career to this point, though, that's (unfortunately) not all that bold a statement about the legendary blues guitarist. While blues purists may cringe at the characterization of this album as among his finest  likely pointing to his outings with harmonica player and longtime collaborator Junior Wells or his solos sets for Chess in the 1960s  this recording captures the full essence of Guy's artistry more so than his straight-ahead blues outings. Mixing his intense Chicago electric blues with covers of rock songs like John Fogerty's "Change in the Weather" or soul classics like Ray Charles' "Mary Ann" and Marvin Gaye's "Trouble Man," Guy exhibits a versatility and exuberance not always found on earlier releases. His guitar cuts like a scythe; his vocals are full-throttle. And listening to "Feels Like Rain," one gets the feeling that Guy had as much fun recording it as we get hearing it.